When I worked in an office, in a full-time job, I spent most of the day feeling anxious and on edge. Being an introvert, working in an office (an, horror of horrors, an open-plan office), and I remember getting into my car and breathing a sigh of relief to be in my own space. I could only really relax once I was on my own. So, you’d think working from home would mean I’d be relaxed all the time? Right? Here’s the flipside. Working from home means it’s hard to stop working, turn off and step away from your work. In the office I couldn’t wait to escape, but now I’m at home, it’s much hard to have that cut off time (e.g getting into my car and relaxing). Relaxation is so important, especially as you are your busiensses’s most important resource, and you’re juggling so much. But a lot of us are pretty terrible bosses to ourselves when it comes to stopping and unwinding from work. So, what’s a freelancer to do? Fear not! I’ve got five tips to help you reclaim your relaxation time back. Intermediate: Put your phone away somewhere, close enough for you to hear if someone rings, but far enough that you can’t just reach for it. Advanced: Turn that bad boy off. Not silent. OFF. Or at least in aeroplane mode. Find your relax mode. Everyone has different preferences with their chosen relaxation activities. For me, I rarely sit and do one thing, so just sitting and watching a movie and nothing else doesn’t work for me. Walking, either with Oscar in the buggy, or a podcast plugged in, is my ultimate unwind activity (I know, still using my device, but I keep it tucked away in my pocket). Or a really good bath with podcasts or a movie playing. For you, it might be a really good workout, 10 minutes of meditation, indulging in some cooking or putting Netflix through some marathon training. Or creating a little zone in your home which you can retreat to for relaxation. For me, that’s the bathroom. Because it has a lock and all the books. What makes you feel good, tops up your energy or makes you feel focused again? Don’t worry about what you feel you SHOULD be doing, focus on what works for YOU. Make it a daily habit. I try to do one bit of self-care each day, and noting it down makes me more mindful of doing it. When you make self-care a priority, you’re effectively giving your brain the chance to relax and recover every day, rather than waiting for it to get completely overwhelmed. Little and often! Set goals. It’s very easy as a freelancer to always have something next on your To Do list. So firstly, accept you’ll never finish your list. Ever. Go on, take a big scary breath and accept that you’re not going to reach the perfection of a list full of ticks. Done? Great. Now set yourself three goals each day. If you do those, you’re doing well. If you do more, great! But don’t work into the night trying to fight a losing battle with your list. Set yourself a finish time for the day, and set your goals. That structure will help keep you focused, and allow you some unwind time too. Schedule in your monthly treat. One thing I do in my Facebook group is to prompt group members to set themselves a fun activity or challenge each month. It’s a way to remind ourselves to schedule in something fun. I know, I know. Scheduled fun. *Shudder* But so often, we freelancers can be so focused on growing our businesses, that we forget to have a bit of fun. So, set yourself a reminder for the first of each month to book in something fun. Whether it’s a half day at a spa, a trip to the zoo, a meet up with another freelancer, or a quick skydiving session (casual), booking in something fun is a great way to have something to look forward to. These are all small changes that can make a big difference in the long-term. Like the idea and want to implement some more small changes? 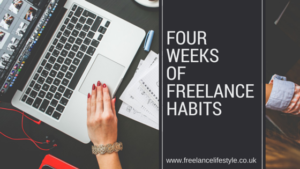 Take my free Four Weeks Of Freelance Habits course! How do you unwind and relax as a freelancer? This was very timely for me! I’m having trouble disconnecting when there’s always more to do. I love the idea of setting that ‘treat’ for the month, something to look forward to always helps!